Discover a new world of unexpected gaming experiences with KMAX VR. What we can do by VR All in One? 360 degree Panoramic:Be Personally on the scene. Local cinema play by yourself. Lover active movie no need hide anymore. 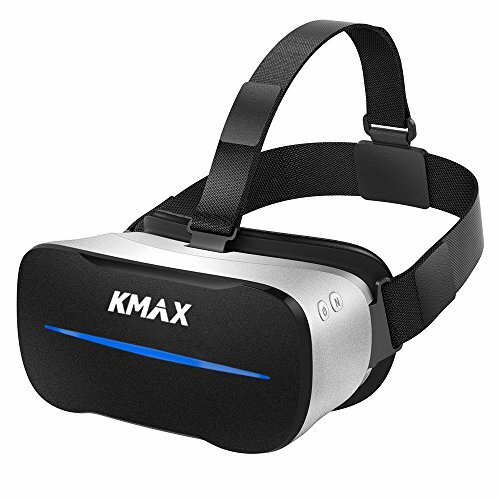 KMAX RV Build in Geo-Gyroscope,choose the item by eyes' point and control the game via turn around head,so you can walking in virtual reality world easily,no matter indoor or outdoor,you will enjoy the wonderful 3D video and game after wear the VR all in one . OS:Based on andrord4.4 customized multi dimension system. All In One - No phones,no computers, no gear. The ECVILLA is built on an Android interface, making it ready to use right out of the box. Includes USB and TF slots for external capacity. 3D AudioTechnology - Explore 360 degree universes in 3D that respond to your gaze and movement, without need for a base station to calibrate. Wireless Connection - Use the onboard Wi-Fi or Bluetooth to connect to Google Play and YouTube, where you can download from thousands of games, movies, and apps. Advanced VR Display - Seamless visuals keep you connected to the virtual world through an expansive 5.7"OLED 1080p display running at up to 120 frames per second. Ultra Portable - Its built-in 4000 mAh battery means you can experience longer uninterrupted sessions of 1080p VR. With gamers in mind,delivers a new world of unexpected gaming experiences. If you have any questions about this product by ECVILLA, contact us by completing and submitting the form below. If you are looking for a specif part number, please include it with your message.